At the National Action Network Convention in New York on Wednesday hosted by founder Rev. Al Sharpton, Democratic presidential candidate Hillary Clinton announced a new plan to fight for environmental and climate justice. The National Action Network is a nationwide civil rights organizations founded in 1991. While Clinton didn't dive into details during the speech, which was given to a largely African-American crowd at a Midtown hotel, her campaign released a fact sheet outlining the specifics of how to reduce may of the environmental burdens often felt within low income communities of color. "Across America, the burdens of air pollution, water pollution, and toxic hazards are borne disproportionately by low-income communities and communities of color," states the fact sheet. For example, according to the fact sheet, in one area of Houston, Texas that is 85% Latino with 27 schools located within a mile of a chemical facility, children attending public schools are 56% more likely to get leukemia than those who live 10 miles away. "Simply put, this is environmental racism," states the fact sheet. Furthermore, the impacts of climate change in the form of more severe storms, longer heat waves, and rising sea levels, will "disproportionately affect low-income and minority communities, which suffer the worst losses during extreme weather and have the fewest resources to prepare." In the wake of the crisis surrounding lead-contaminated water in Flint, Michigan, a main platform of Clinton's plan is to eliminate lead as a major health threat within five years. According to the fact sheet, more than 535,000 children are poisoned by lead in the United States—with children of color more likely to be poisoned than white children. Clinton proposes establishing a Presidential Commission on Childhood Lead Exposure that will be tasked with writing a national plan to eliminate the risk of exposure from paint, pipes, and soil within five years along with other initiatives to devote energy and resources to the cause, including up to $5 billion in federal dollars. Protecting public health and safety by modernizing drinking and wastewater systems. Prosecuting criminal and civil violations that expose communities to environmental harm strengthening public health protections. Creating new economic opportunity through brownfield clean-up and redevelopment. Reducing urban air pollution by investing in clean power and transportation. Protecting communities from the impacts of climate change by investing in resilient infrastructure. Establishing an Environmental and Climate Justice Task Force to make environmental and climate justice, including cumulative impacts, an integral part of federal decision-making. 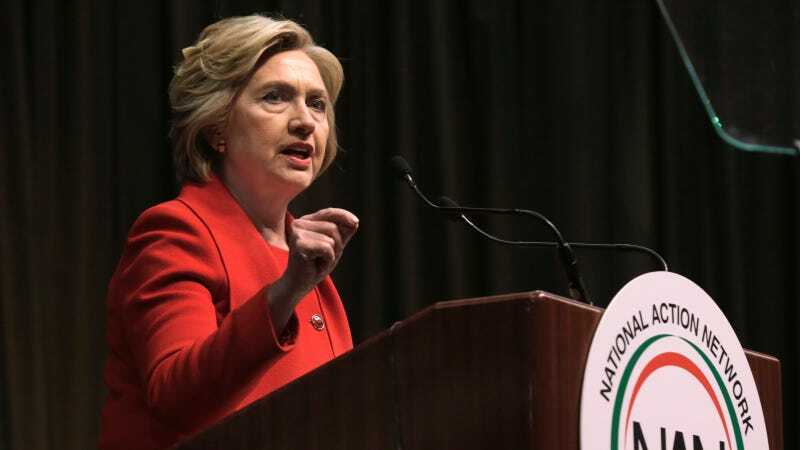 While Clinton does not seem prepared to call for an outright ban on fracking, the campaign's new platform for environmental justice gives her a number of environmentally friendly proposals to reference going forward.